I have been searching for a Ronnin for a while. 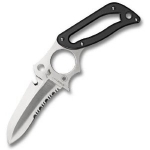 Due to the fact that Spyderco had discontinued this model, it was very hard to find, even in the Internet. I found this in a knife shop in CT, since it is a regular item, i paid full retail price for it. The blade shape was like an over-size razor blade, sharp and thin, very distructive if use on any human or animal skin! It carries in either the bely mode or neck carry, I prefer the neck carrying method because it is so easy to take it out of the sheath in a upside down position. The 3 holes in the handle makes it easy to switch from a forward to reverse grip position, which is a plus for a fixed blade. Overall, this is a great knife but if the price was lower, it will be a better buy! !